Jenny Kane - jkane@shawmedia.com Natalie Dunham of Nashville Tenn. discusses how many rows of twine to add to her work with her boyfriend Oskar Urbanowicz. Dunham was installing her artwork at the Old Court House Arts Center in Woodstock for the 25th anniversary show of Women's Works. Jenny Kane - jkane@shawmedia.com Natalie Dunham of Nashville Tenn. with installs her artwork made of twine at the Old Court House Arts Center in Woodstock for the 25th anniversary show of Women's Works. Dunham who grew up in Lancaster, Pa., says she is inspired by simplicity and by the Amish culture. 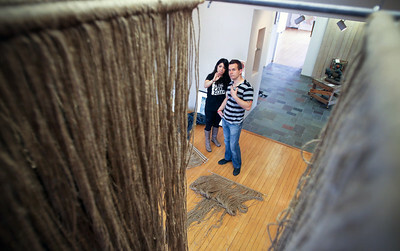 Natalie Dunham of Nashville Tenn. with installs her artwork made of twine at the Old Court House Arts Center in Woodstock for the 25th anniversary show of Women's Works. Dunham who grew up in Lancaster, Pa., says she is inspired by simplicity and by the Amish culture.